Getting the right size AC unit for your house is very important if you want to have the desired level of comfort and good energy efficiency. The smallest unit is 18,000 BTUs (1.5 tons), while the largest is 60,000 BTUs (5 tons). Today electricity is very expensive and you don’t want to waste it on running a unit that is too big. On the other hand, getting a system that is too small will not keep your house cool, so while you will save money, you will not have the optimal temperature control. The best course of action is to hire a licensed installer who has a comprehensive, professionally designed HVAC calculator. He will come in for an in-house estimate and tell you exactly what size central air unit you need. Lets take a look at what this calculation entails and why its important to get it. We will also show you how to do a DIY estimate to figure out the central AC unit size you need. Before we get into sizing a residential central air unit, lets take a quick look at pricing. On average, homeowners report spending $3,900 – 5,000 to install a 2.5 ton central air system in a house that has functional ductwork. Prices for central air units vary primary based on size (tonnage). The smallest AC unit 1 ton (12,000) costs $1,800-2,000. The most popular unit size is 2.5 tons, and it costs $3,500 – 4,500. Very powerful 5 ton units cost $6,000. In general, you can roughly add $800-1,000 for each additional ton, as the units go up in size. Final pricing for central air units also varies based on brand name as well as other features. Its best to purchase a unit from a well known, reputable manufacturer that offers a very good warranty. Top brands include: Amana, Day and Night, Goodman Air, Carrier, Bryant, American Standard, York, Daikin, Mitsubishi, Maytag, and Heil. Ask your HVAC installer to a recommend a couple of brands he trusts. The term “size” of a central air unit does NOT refer to the physical dimensions. Rather, size is a measure of its capacity to generate cool air. The size of an AC unit is measured in tonnage as well as BTU (British Thermal Unit) per hour. 1 BTU = the amount of energy needed to raise 1 pound of water by 1 degree F.
1 Ton = 12,000 BTUs per hour, or the amount of energy it takes to melt 1 ton of ice in a day. Consequently, sizing involves determining the home’s cooling load: the exact capacity in BTUs per hour and cubic feet per minute of airflow required to maintain a 78 degree temperature in the house. A unit that is above 5 tons is considered commercial size and these large units are actually not available for home installation. If your house actually requires a unit that is over 5 tons, your HVAC contractor will install two units to match your home’s cooling needs. The most popular central AC size that works for the majority of residential homes is either 2 or 2.5 ton unit. Get 3-4 free estimates from local HVAC pros to find out how much your new central air system will cost. 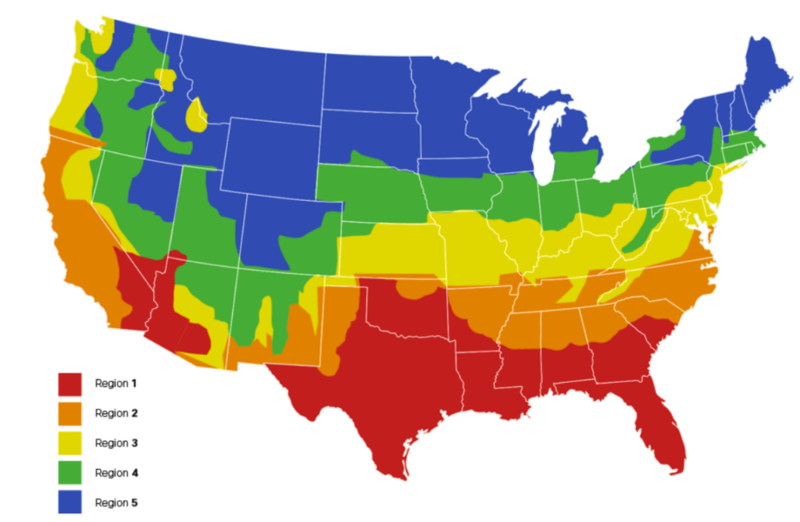 If you just want to get a quick sense about the air conditioning tonnage size your home needs, take a look at this heat zone map and ac sizing chart. Next, look at the chart below, and find the appropriate zone as well as the square footage of your house. Then, look at the corresponding unit size. Keep in mind that this is the least accurate way to determine the proper central air system size for your home. It does not take into consideration any of the specific factors that can really impact AC size needed for a particular house. We will get into these below, and show you a more accurate way to do the estimate. To get a truly accurate size for central air that will work most efficiently in your house, you need to do a professional load calculation, known as “the Manual J”. Most HVAC installers include it for free as part of their estimate, when they give you the total cost to install central air in your home. Pro Tip: its best for you to ask him to actually perform a complete Manual J assessment (they have the software program that runs it). Don’t settle for a ball park estimate based on a quick visual assessment, as it will not be accurate. You should not trust an HVAC contractor who does a quick walk through your home, and gives you the AC tonnage your home needs just off the top of his head. There are just too many factors at play here. The guy is not a magician and has no way of making a real estimate without using professional software. Also, be ware of contractors who suggest that you should simply install the same size unit that you currently have. This is a huge mistake, as the current unit that is being replaced may not be the right efficiency for your house. If the contractor is not willing to do the initial assessment thoroughly, he is likely to cut corners on the installation itself. There are two types of Manual J calculations ( whole house and room by room) and your contractor will decide which one is best to do, depending on your particular situation. It is recommended to do a whole house Manual J if you are only planning to replace/install the AC unit itself and will not touch the ductwork. Pro Tip: we strongly recommend replacing your old ductwork, unless you know for sure that it is working properly. This is important because you will be loosing a lot of air through leaking ducts. This translates into wasting a lot of energy and money every month. Even if you get the most efficient ac unit, these savings will be nullified if you have a poorly functioning duct system. If you are not sure about whether or not your ducts are in good working order, ask the installer to inspect them. It has the same inputs as the whole house one, except it is done for each room. Then they are all added together to get the final result. Overall, a room by room calculation is more accurate than a whole house one. It is recommended to use this method if you are planning to replace the ductwork in addition to the AC unit. As you may have already guessed there are a number of important variables that will effect the size of the central air unit your house requires. Total number of square feet is just one of these factors. In fact you can have homes that are identical in size, but still call for completely different size units. Amount of sunshine your home gets: you may have very bright, hot rooms that get a lot of sun, as well as darker, naturally coolers rooms where the sun does not come in a lot. Insulation: how much of it and what type.For example, its very important to have proper roof and attic insulation, as that is where a lot of the air escapes. If you want to get a sense of how big of a central air unit your house will need, it is possible to get a rough estimate on your own. However, it is important to realize that because there are so many factors that may impact this calculation, you will most likely not be able to take them all into account properly. Thus, your final assessment may not be very accurate. This means that your house requires a central unit of 4 to 4.5 tons. However, if you live in a hot climate, where temperatures are high most months out of the year, you will need to change the formula slightly, because otherwise your unit will be undersized. Instead of subtracting 0.5, you will need to ADD it. This means that your house requires a central air conditioning unit of 5 to 5.5 tons. Pro Tip: as a rule of thumb, the maximum AC unit size you need to install should not be more than 15% more than the BTU’s you need to cool your house. This means that if your house requires a 24,000 BTU unit (2 tons), you should not install one that is larger than 30,000 BTU’s (3 tons) to maintain energy efficiency. Many homeowners hold on to the misconception that it can’t hurt to get a bigger central air conditioner than needed, just in case. If the HVAC contractor recommends a 2.5 ton unit, many are tempted to install a 3 ton or even 3.5, just to make sure that the house will be cool enough. This would have been a good idea 20 years ago, when electricity rates were cheap, and AC units used A LOT of energy to quickly cool off the space. In those times, bigger really was better. Today, new air conditioner units are energy efficient. This means that they save energy by running in cycles, which results in your home being cooled at a slow and steady, rather than a rapid pace. Because of this change in how the AC unit operates, its essential to get one that is just the right size for your house. Here is a quick summary of the main reasons why it is not advisable to install the wrong size central air, whether too big or too small. In addition to sizing, its important to consider other features of a central air unit, such as the SEER rating, 1 vs 2 cycle system, fancy extras that high-end brands like to include, etc. AC units are not all created equal. There are significant differences in pricing, quality, durability and warranties offered by various HVAC manufacturers. The importance of a quality install cannot be overstated enough. Over 40% of all HVAC systems, including central air conditioners, fail due to incompetent, hack job installation. Especially if you are willing to spend extra money on a premium brand name AC unit, such as Carrier, don’t try to squeeze a few hundred dollars of savings by hiring a sub-par installer. What if my rough calculation is 4.67. Would you round up to a 5 ton unit? While I don’t know how you did the calculations and what values you used, I generally would recommend with 4 ton instead, because most specifiers / contractors and even homeowners overestimate what they really need for capacity, and in the end spend much more than they need, in operating costs. Also keep in mind, that it’s much more “efficient” to fix air leaks, insulate, etc., than to oversize your HVAC system. If you don’t mind – what is the square footage that you used in calculations? I hope you can help me. I’m planning on replacing my 28 year old 4 Ton 5 Seer air conditioning unit and ducting. Using your formula I figured a total square footage in my home at 1595.25 sq ft. I felt a 3 ton unit would be enough but in the square footage I measured itt includes a den with a high open beam celling. its like a rectangle measuring 17.5 x 19.5. the celling is on the longer side of the four walls. the outside edge is 10 ft high then it goes up a little over 12 ft. Because of the high celling and the open beam it was suggested we have two registers and a return at a nearby hall way .this still remains the warmest room in the house. I bumped up to a 31/2 Ton mainly because of the den. Two installers went into the attic and suggested 4 Ton units like I already had. I thought it was to easy to just t copy what I had,, one installer thought a 31/2 Ton would be perfect. Please let t me know what you think should I purchase a 4 Ton, m31?2 or a 3 Ton unit . The only reasons you don’t want a larger size unit is because it costs more upfront. That’s it! It is like buying a 5 Amp power supply to power a 0.5 Amp device. You can just buy a cheaper 1 Amp power supply for that. All this nonsense about costing more to run and other bs is not true. Costing more to run will depend on your thermostat setting. That’s it!